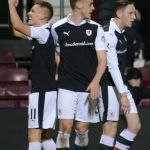 Raith Rovers bowed out of the Scottish Cup this evening, but only after a pulsating tie at Tynecastle which ebbed and flowed, before Hearts eventually edged through after extra time. 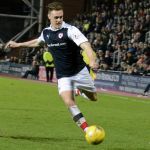 Raith boss, Gary Locke made one change from the side which took the match to a replay with a late Declan McManus goal on Sunday, with the goal-scorer replacing Chris Johnston who dropped to the bench. 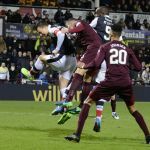 Rovers ended the first match with the upper-hand, and they looked intent on starting as they’d finished on Sunday, taking the game to their more illustrious opponents in the opening moments. 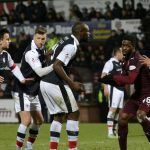 Rovers energetic start was exemplified after three minutes, when McManus did well to hustle and harry Lennard Sowah out of possession before winning a corner, whilst the same player was denied by Jack Hamilton at his near post following a snap shot, after racing on to a Ross Callachan through ball. 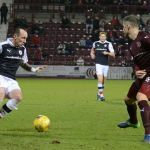 Whilst it was early days in the tie, the signs were encouraging, and Hearts skittishness was summed up by Hamilton shanking the ball into the stands after being chased down by Stewart. 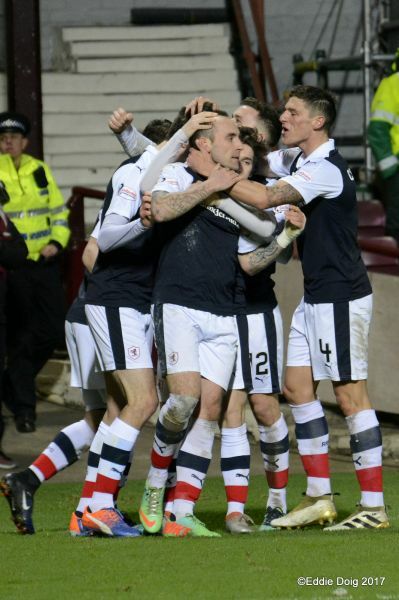 A bright start would ultimately be futile if it failed to conjure up tangible rewards of course, but it did just that, and what a reward it was from Bobby Barr in the 14th minute. 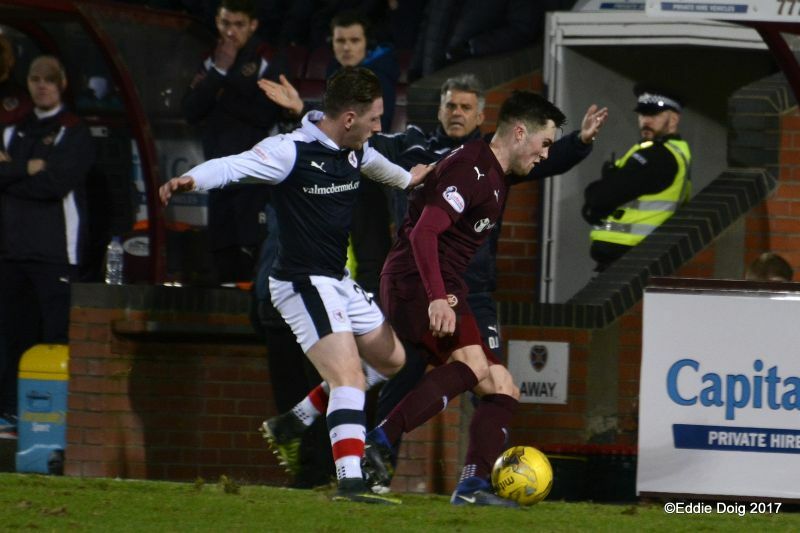 From Hearts corner, Barr picked up a clearance and ran at the Hearts rearguard. 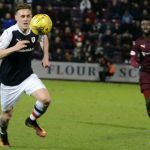 Looking at his options, he decided his best was to go it alone, and his deflected shot from 25-yards out spun away from Hamilton’s outstretched hand to give Raith a deserved lead. 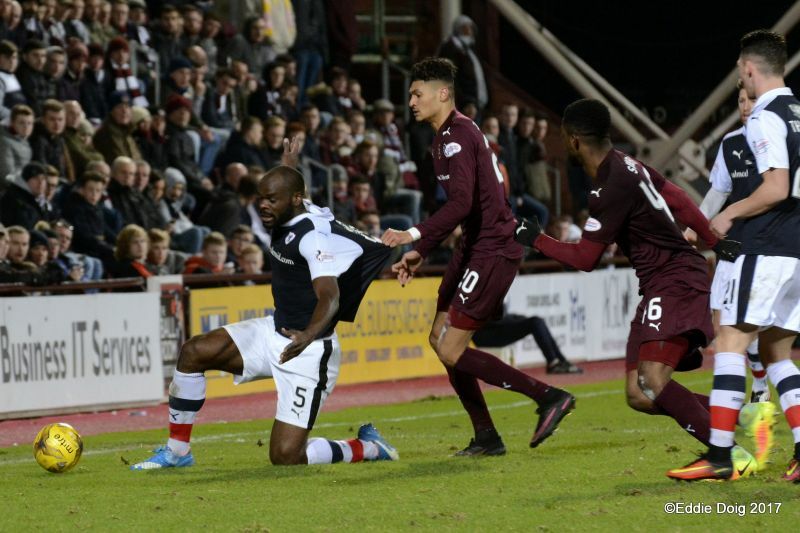 There was no immediate response from Hearts, and Raith’s high pressing game was forcing Hearts into gifting possession away, and Rovers were unlucky not to double their lead after 20 minutes, when M’Voto headed a cross from the left-hand-side just wide of the target. 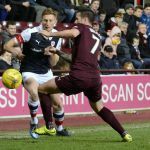 With Rovers snapping into challenges and Stewart and McManus chasing down a panicked Hearts back-four, the home fans weren’t shy in letting the players know their exertions weren’t appreciated, as boos reverberated around the stadium after 25 minutes. 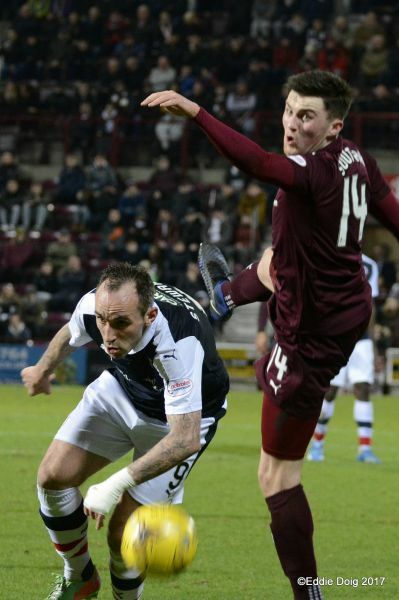 If anyone was going to lift the home side out of their funk, it was probably going to be Jamie Walker, and he almost restored parity after half-an-hour. 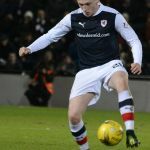 Stepping away from Iain Davidson, he took aim through a crowd of players from 22-yards, but while Cuthbert was likely unsighted by the flurry of limbs, the winger’s shot was just wide of the keeper’s right stick. They did have an effort on target a minute later though, as Malaury Martin managed to twist away from harm on the edge of the area, before curling in an effort which Cuthbert had to dive full length to his right to palm away. 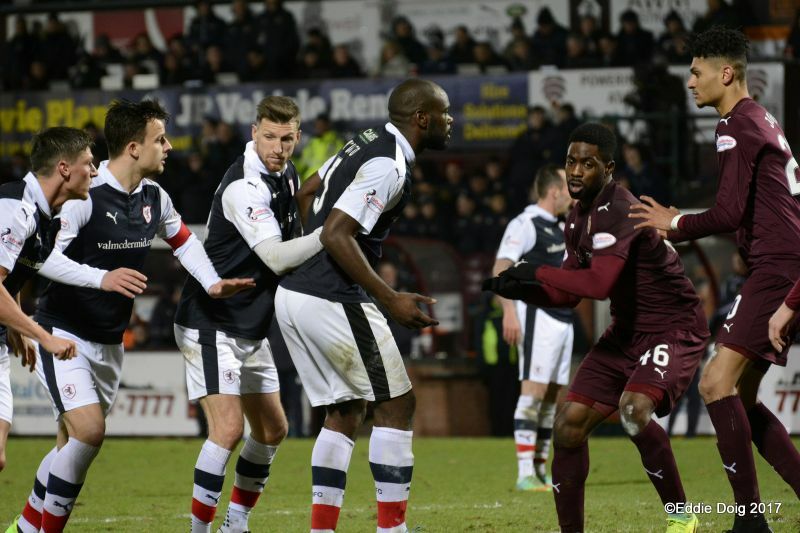 Hearts were now starting to exert pressure, but like Sunday, their goal came from turning over Rovers possession. 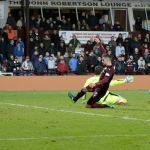 Jordan Thompson was caught in possession midway inside the Hearts half, and with Rovers short of numbers at the back, Hearts capitalised on the quick breakaway. 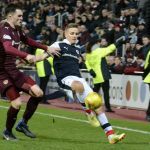 Bjorn Johnsen gallivanted up-field, and after beating Barr, he played an incisive a pass to Rory Currie, who finished confidently from close range. 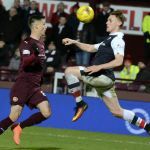 Considering how well the game plan had been coming along, it was a huge blow, although Kevin McHattie almost got lucky a couple of minutes later, when his cross drifted over everyone, including Hamilton, only for it to end up on the roof of the net. 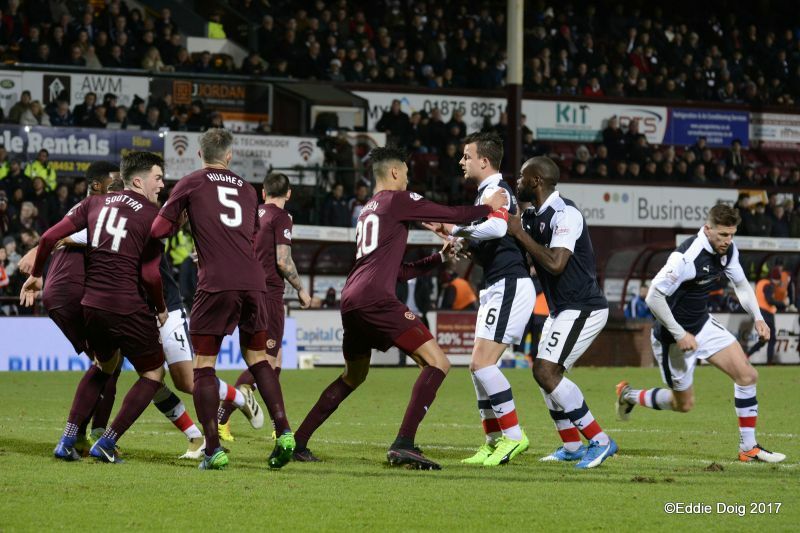 Barr was next to try his luck with half-time approaching, taking possession inside the penalty area, but after evading a challenge, his shot from an angle was straight at Hamilton’s chest. 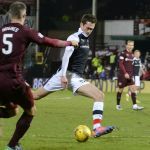 Barr fizzed a low cross into Stewart’s feet on the edge of the area, and despite close contact, he managed to turn his marker and drive a shot just past Hamilton but into the side netting. It was an indication that despite the Jam Tarts holding the whip-hand, they were still looking susceptible at the back. 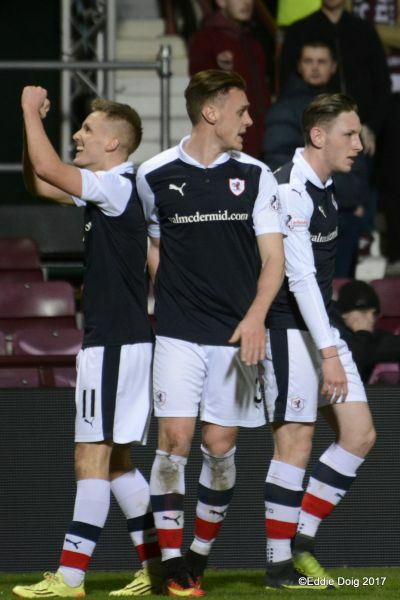 Cathro’s men had been kept at arms length for much of the second-period, but they almost took the lead with a goal which would have been similar to Raith’s opener, when Andraz Struna’s drive looped off Callachan and had Cuthbert on the back-foot, with the custodian eventually thankful to see it dip over the bar. 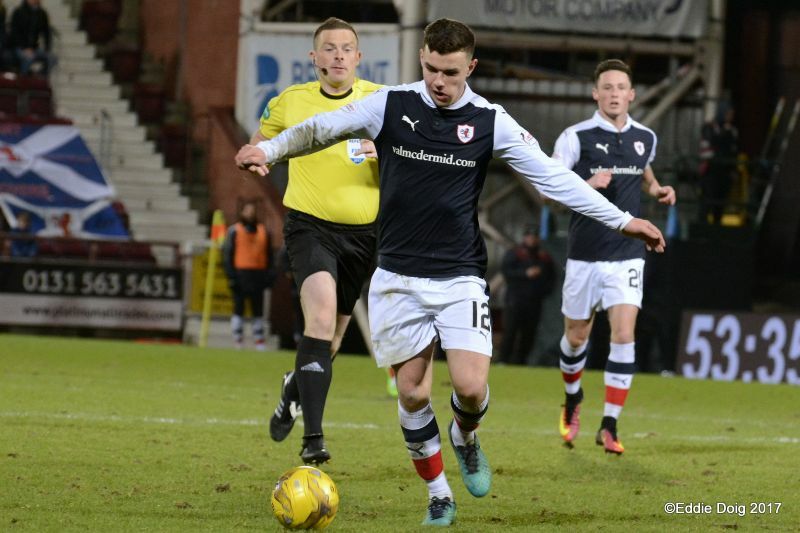 Rovers then missed a gilt-edged chance with 25 minutes left. Again, Barr was the archirect, breaking at pace and spotting Stewart in bags of room inside the box. 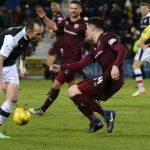 However, as the ball broke to him, his first touch was far too heavy, and despite having just Hamilton to beat, the chance was lost. They were almost made to pay for that profligacy just a minute later, when Martin’s free-kick picked out Nicholson at the back post, but he somehow sent his header over the bar with the goal gaping. 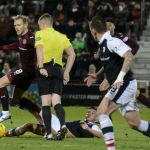 Iain Davidson was then replaced by Jason Thomson, but it was his defensive colleague M’Voto who was next in action, when he appeared to clip Walker inside the area, although referee John Beaton saw no foul, much to the relief of those of a Raith persuasion. 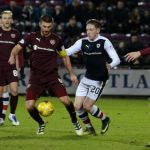 Hearts were looking far sharper by this stage, and while they weren’t forcing Cuthbert into too many stops, the pressure was unquestionably turning up a notch. 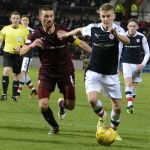 With that in mind, Locke made his second substitution with ten minutes remaining, changing Ryan Hardie for Thompson, with Matthews going into the middle and Stewart to the right. 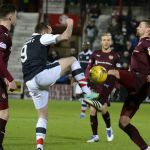 There then followed an incredible stramash a few moments later though, when McHattie could only head a ball off the line and high into the air, forcing him to do the same thing when it returned to earth, before Cuthbert eventually got involved and the danger was finally averted. 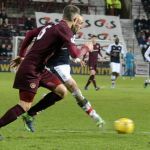 It was all Hearts at this stage, and Martin’s shot from the edge of the area almost snuck in but was deflected wide for a corner, as Raith started to wilt. 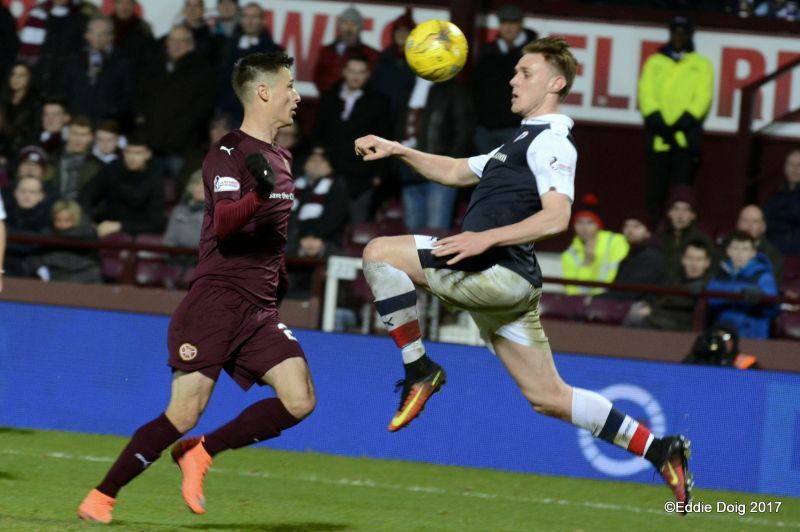 With extra-time looming, Hearts almost snatched it at the death, twice. 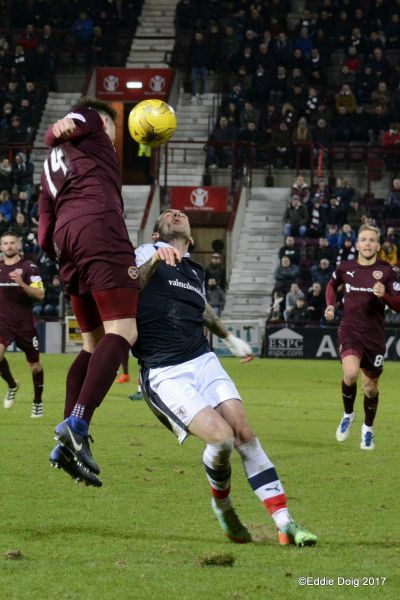 Firstly, Struna’s delivery from the right was met well by Nicholson but his downward header was just clawed away by Cuthbert, before Johnsen saw his shot skiff the post and drift wide. 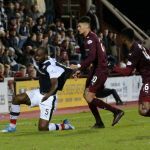 However, while Raith had done excellently to make it to extra-time, it started in the worst possible circumstances, when Benedictus was adjudged to have brought down Walker inside the area. 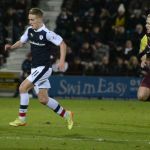 Martin made no mistake from the spot, slotting it safely into the left-side of the net, despite slipping as he struck it. 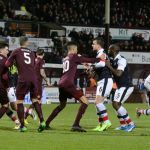 Now chasing the game, Locke made two changes, with Barr being replaced by Skacel, while McManus made way for Chris Johnston, and incredibly, Rovers were level just a minute later. 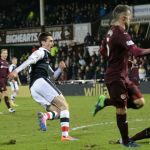 The ball broke to Mark Stewart, and with he and Hardie facing a two on one situation, he slotted it to his partner, who coolly slotted it past Hamilton. 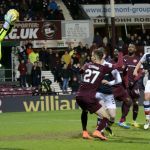 However, the joy was short lived, when Hearts were awarded their second penalty of the match, when Benedictus again fouling Walker. It was Walker who took it himself this time, and he also made no mistake, despite Cuthbert guessing right and getting a hand to it. 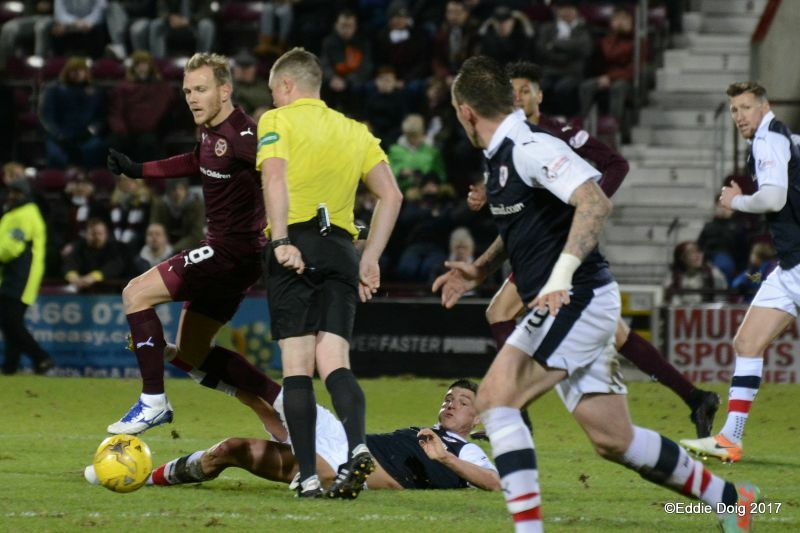 With Raith pushing for an equaliser, they were always capable of conceding another, and when Connor Sammon’s shot squirmed away from Cuthbert’s grasp, Johnsen was on hand to tap home the rebound, and ensure Hearts passage into the next round. 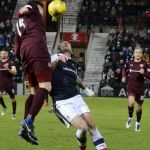 Despite the disappointing finish to the match, it was an excellent display from the away side, with the hope now that those same qualities can be reproduced on Saturday when the Championship fixtures resume against Dumbarton. Welcome to Tyncastle, it's 7 degrees and slightly breezy. 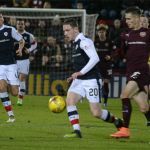 McManus starts with Johnston on the bench the changes from Sunday. Happy Burns Night, to one and all. The Rovers finish their warm up and receive a mighty roar from the travelling support. 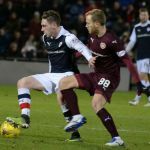 Hearts kick off, the Rovers are playing towards the away support in the Roseburn Stand. 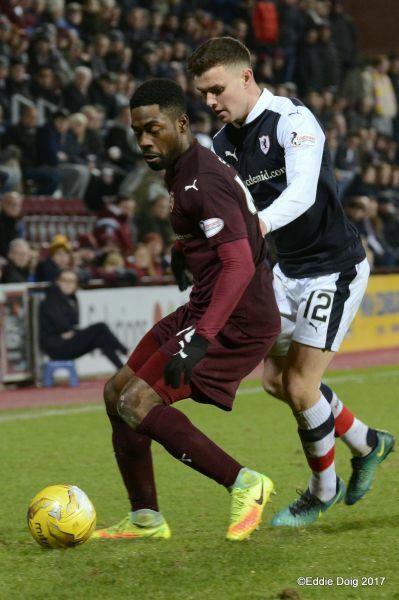 McManus skins Sowah and wins a corner, Benedictus' downward header is saved by Hamilton. McManus with his dander up wins another corner, Stewart has a header saved. 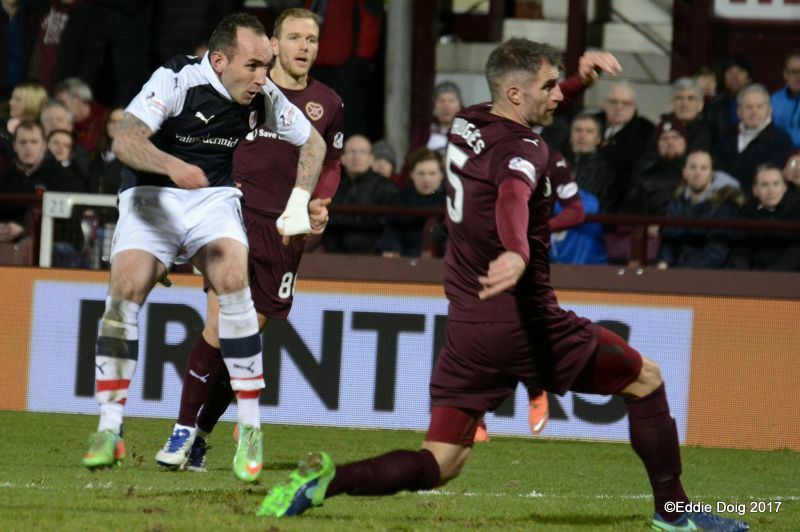 Stewart beats down Hamiltons' clearance, Hearts are rattled. Currie on the attack, Benedictus blocks to deny Johnsen. Johsen sees his shot blocked ftom Martins' second corner. 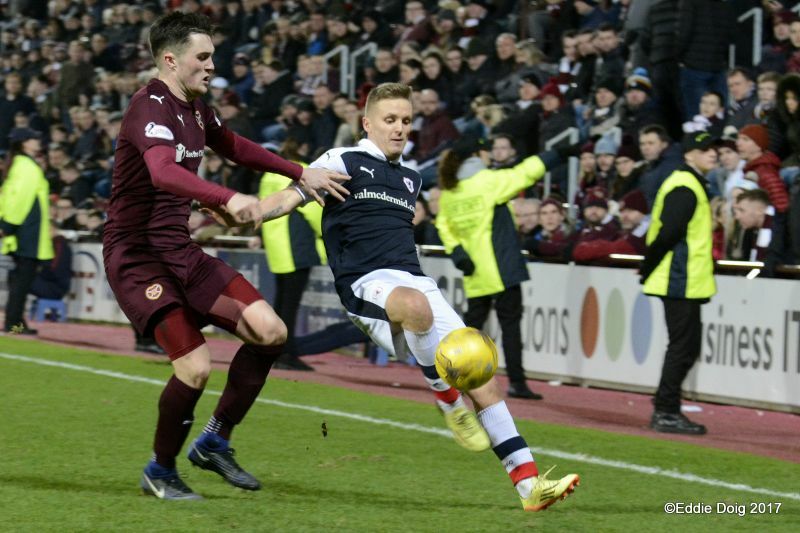 Robust defending from McHattie cleared a Hearts attack. Walker clear through sees his shot deflected for a corner. 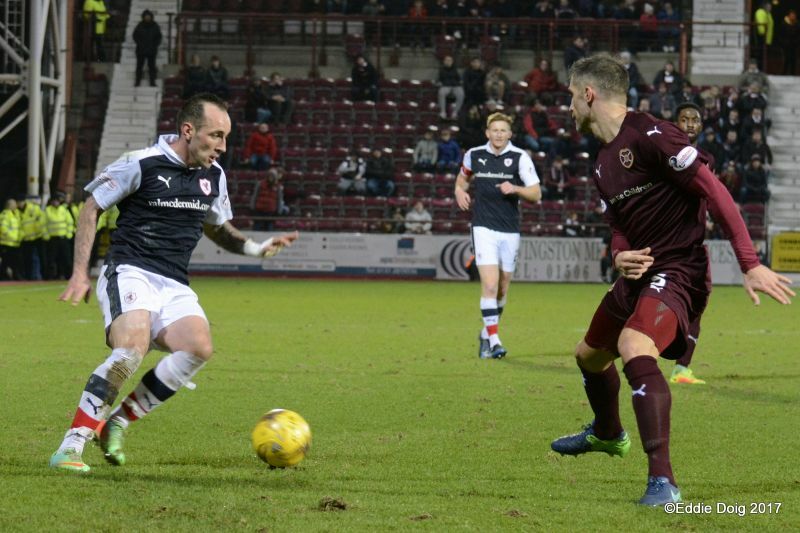 Bobby Barr strolling into the Hearts half shoots from 25 yards into the far corner. GOAL ROVERS. Barr feigned a dig then unleashed a belter. Hamilton comes out to deny Stewart. Rovers choir in full song. 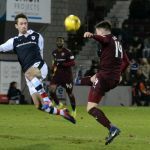 Callachan and Stewart combined to win a corner. Thomson swings the ball in and Big Jock heads wide. 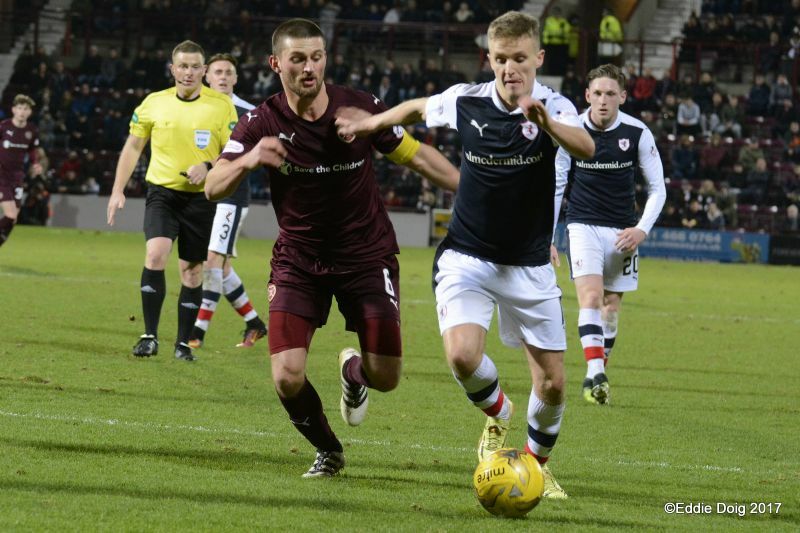 Johnsen can't find a way past Benedictus. 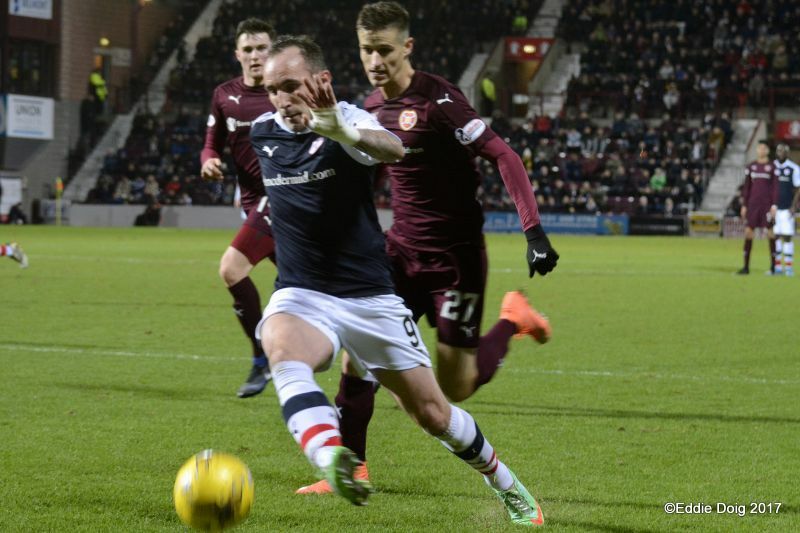 McManus and Stewart forcing errors from the Hearts defence. 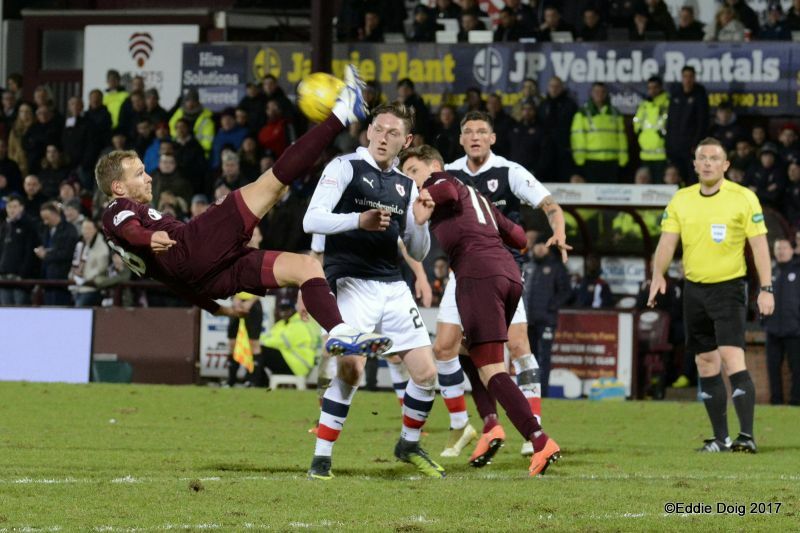 Johnsen can't keep his balance in the box and looks for a penalty. 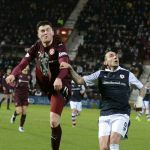 Callachan making mince out of Sowah in defence. Walker speculates with a wayward shot from outside the area, the ball going wide. 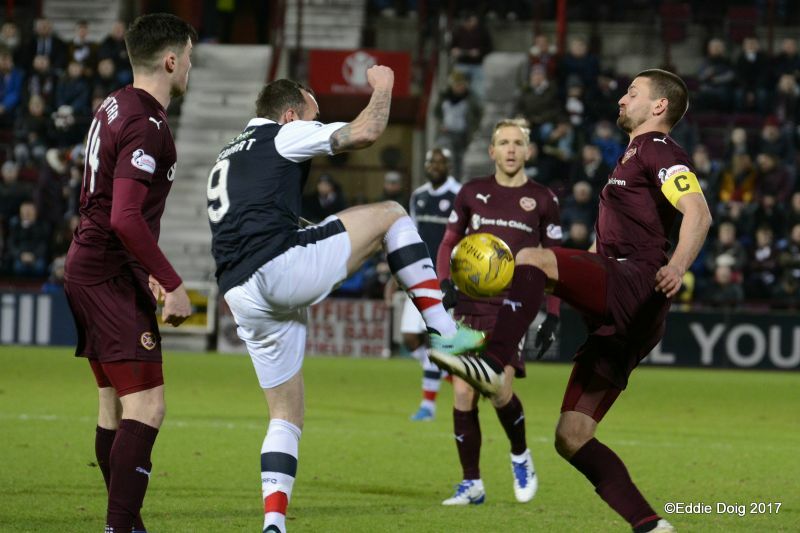 Davo and Kitchen clash, Hearts free kick 30 yards out. Sowah and Martin make a hash of it Struna sees Cuthbert palm his shot wide. 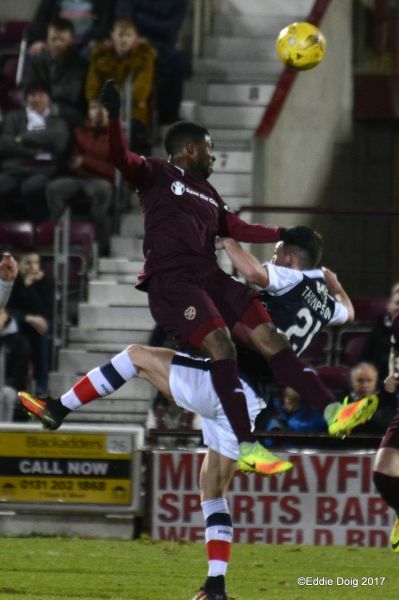 Hearts pressing, three corners on the trot, Sowah tries an overhead kick and skelps the ball wide. 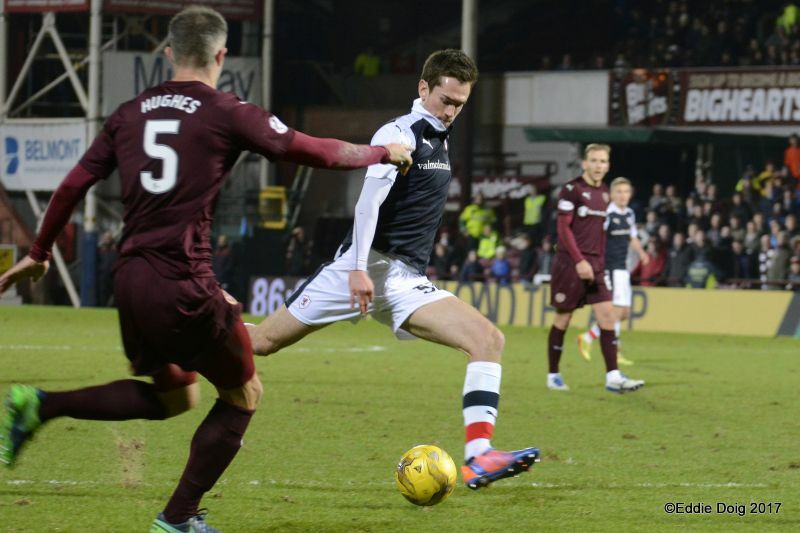 Thomson loses the ball and three passes later Currie slots the ball under Cuthbert for the equaliser. 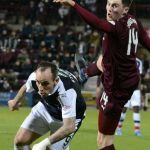 Walker and Currie combine, Walker has two efforts cleared. Barr, jinking on the corner of the box sees his shot saved at the near post. 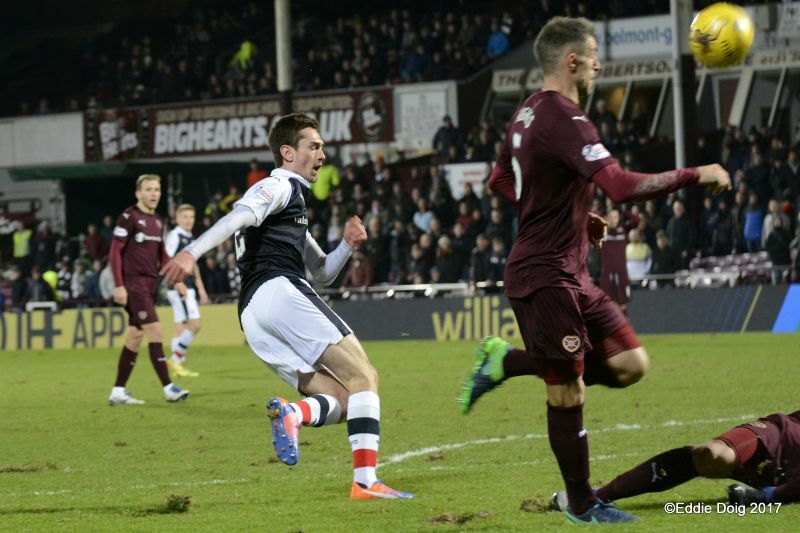 Hearts 1-1 Raith Rovers Half time. Second half delayed due to a sprinkler going off. Buaben off, Nicholson on. 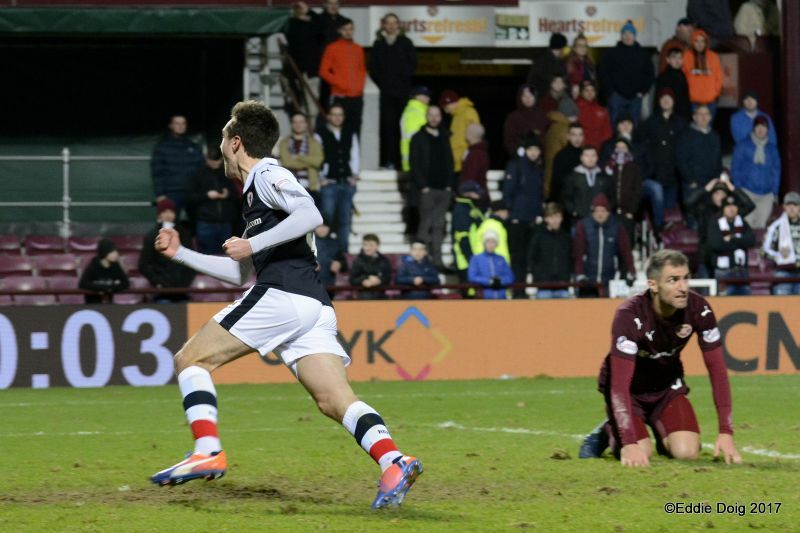 Rovers clear thrir lines after an early Hearts corner. The ball is stuck in midfield. 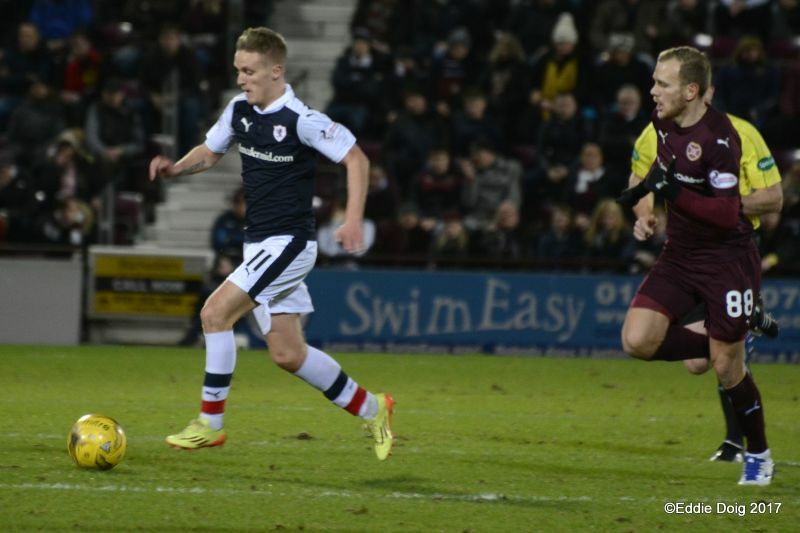 McHattie into S4whose shot is deflected for a corner. Rovers spurn a chance as the corner is cleared. 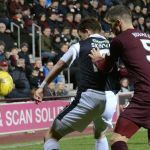 Walker robbed from behind as Davo nicks the ball in the box. Martin hits a tame free kick into the wall, Matthews lauches a high ball at goal from the breakaway. The game has lost the fluidity of the first half. A deflection of the head of Benedictus almost loops into the net. 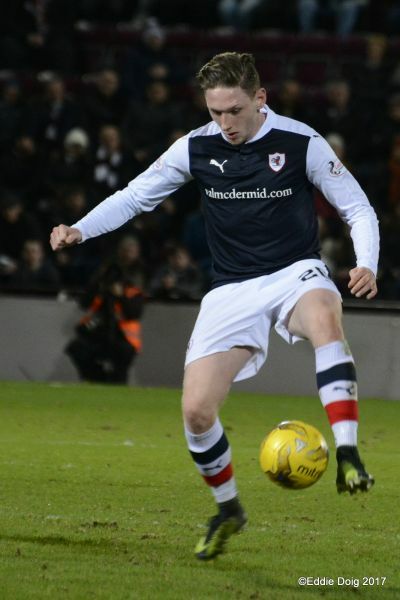 McHattie has a shot blocked after a nice chipped pass from Thomson. 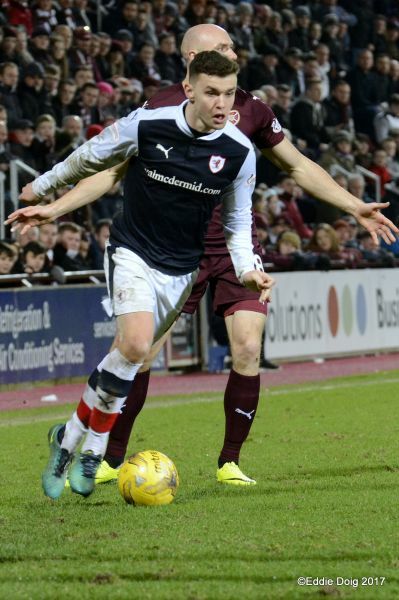 Stewart beats Hughes and one twos with McHattie and sees his shot blocked by Hamilton. 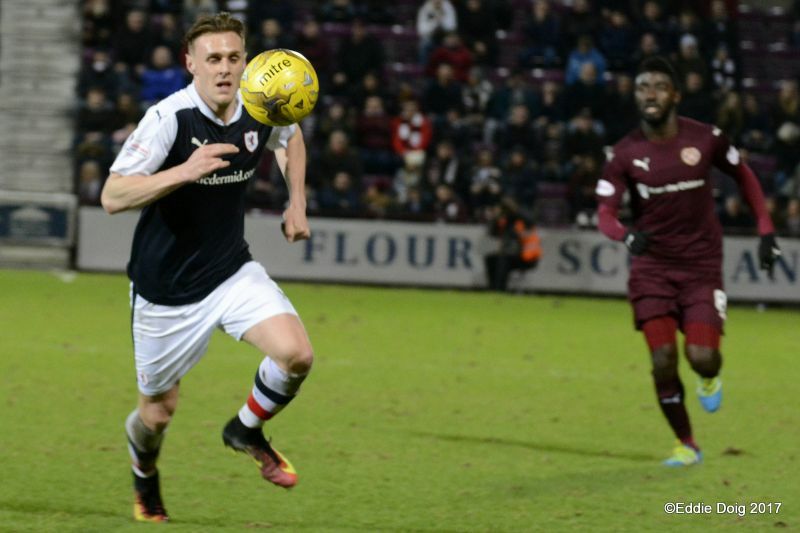 Souttar heads over the bar from a Martin free kick. 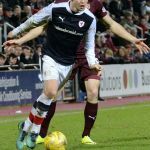 Injured Davidson off, Jason Thomson on. 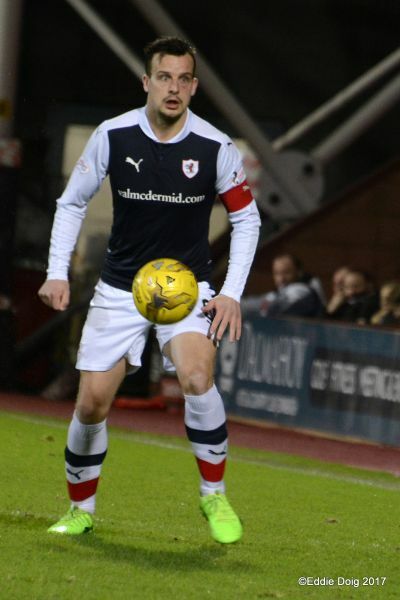 Benedictus hands the armband to Thomson. 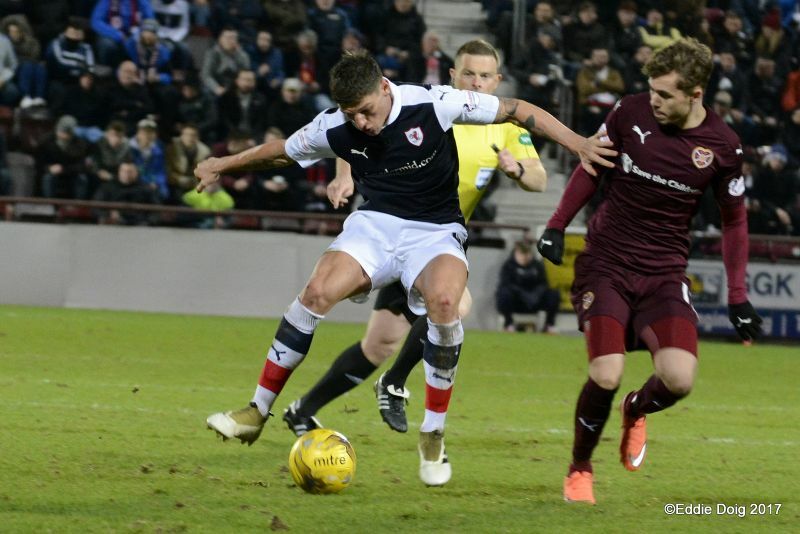 Walker bites the dust in the box, Mr Beaton waves on play. Johnsen has his shot blocked by Currie. 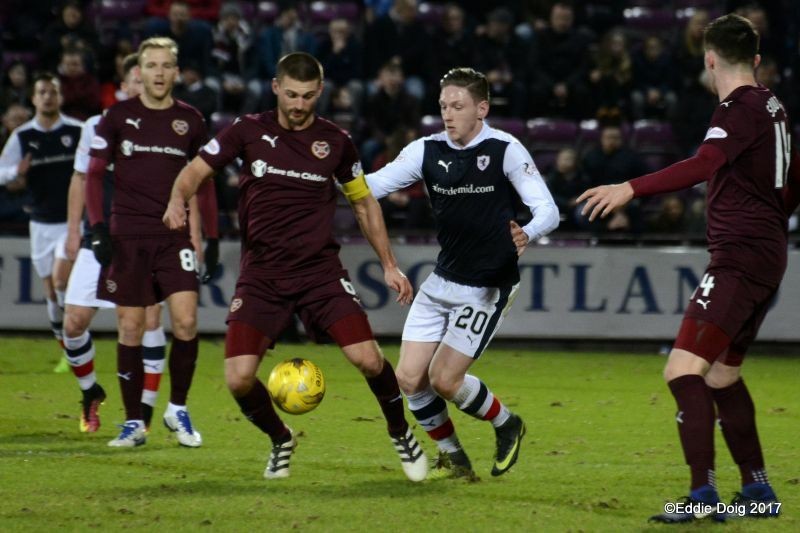 Hearts showing frustration as they fail to make inroads. 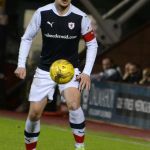 Jordan Thomson off, Hardie on. Tactical. 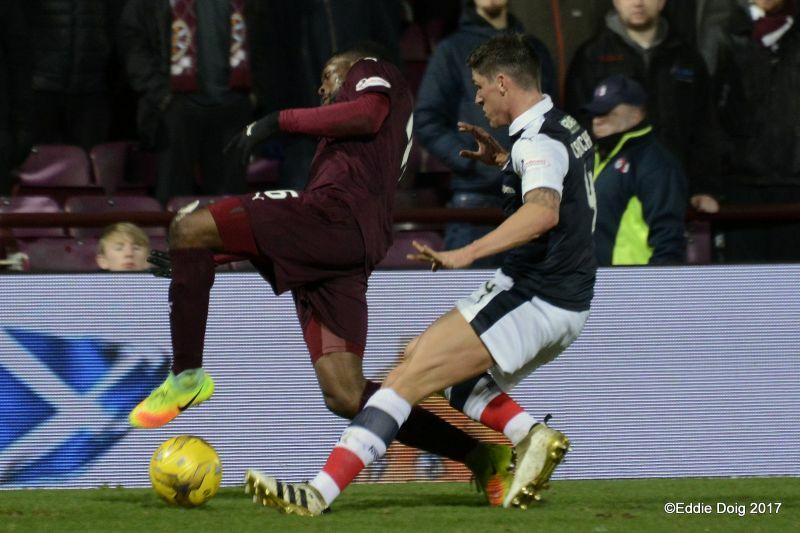 Callachan nips in the box to deny Sowah. 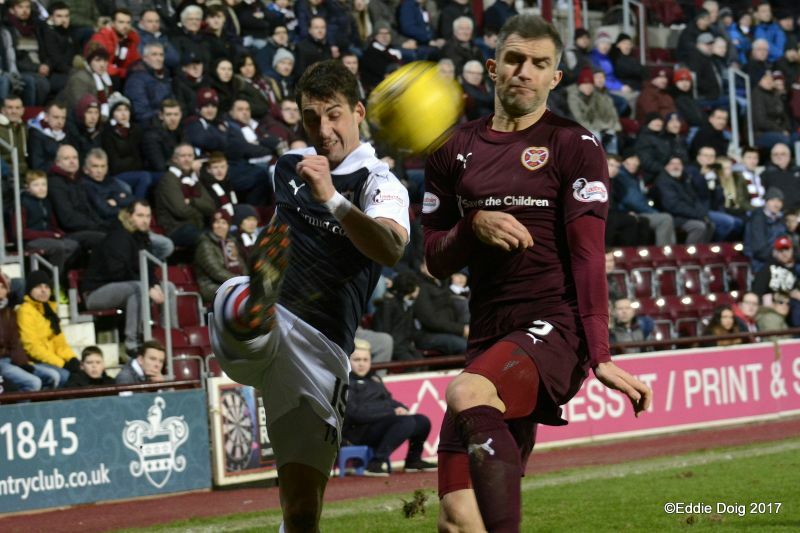 A good old stramash in the Rovers box and the ball is eventually cleared. Hearts on the rise here. Martin shoots from outside the area and is deflected for a corner. 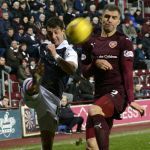 McManus hits a diagonal pass to Stewart but the ball goes out of play. 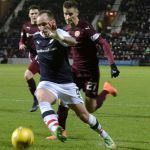 Stewart into McManus whose trundling shot rolls into the arms of Hamilton. 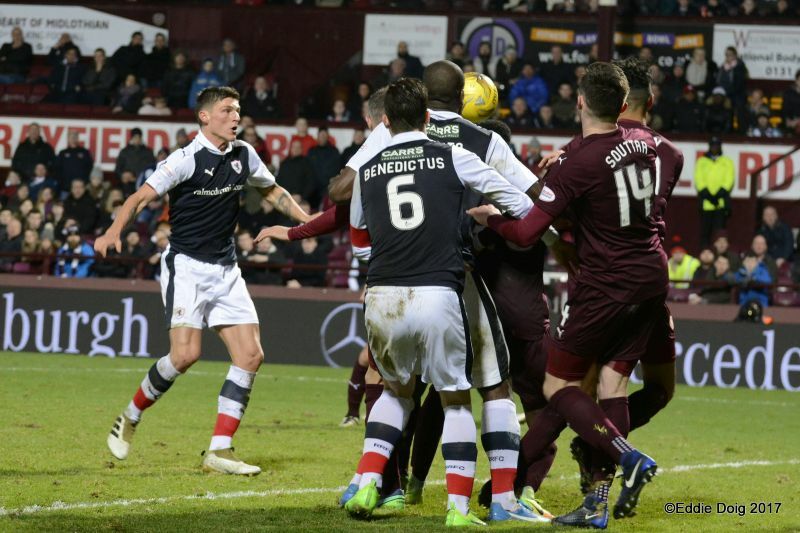 Hardie unleashed a rocket from the edge of the area and is deflected into the arms of Hamilton. 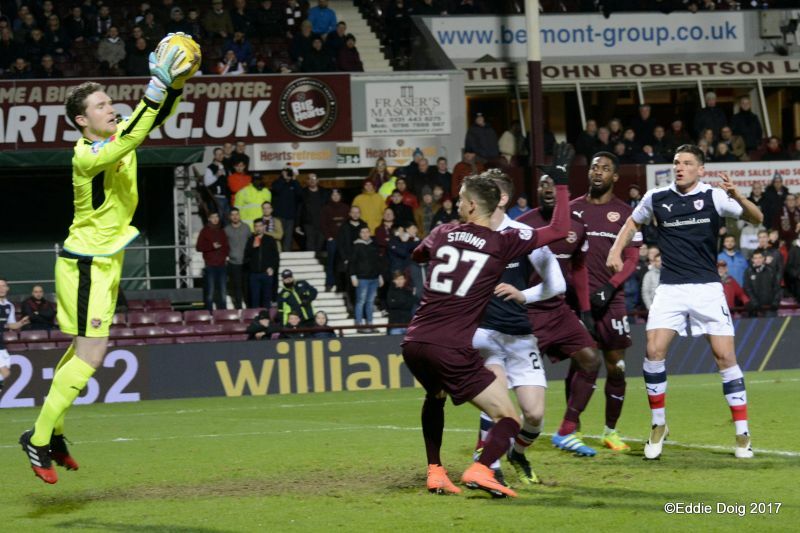 Johnsen leaps and heads goalwards but is denied by Cuthbert. Seconds later the Cat does it again this time Currie with the shot. 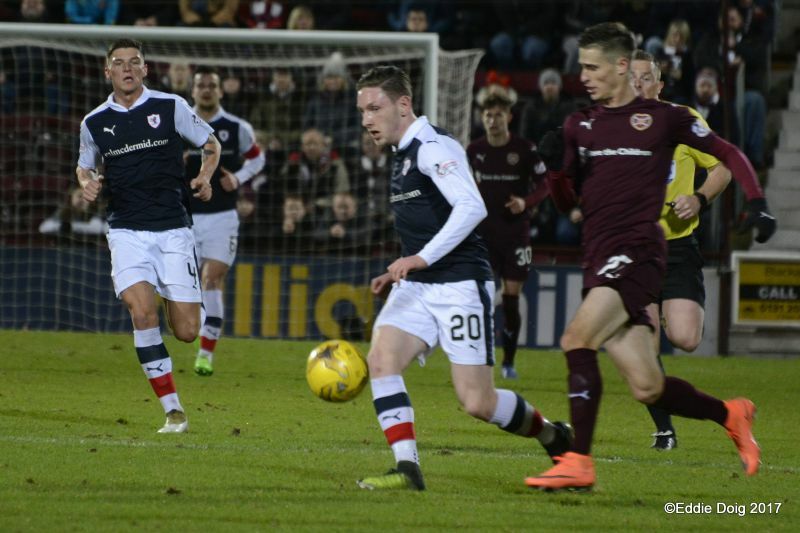 Nicholson sends the ball skimming past the face of goal. +1 normal play finished, we're going to extra time folks. Struna off, Smith on. Tactical. 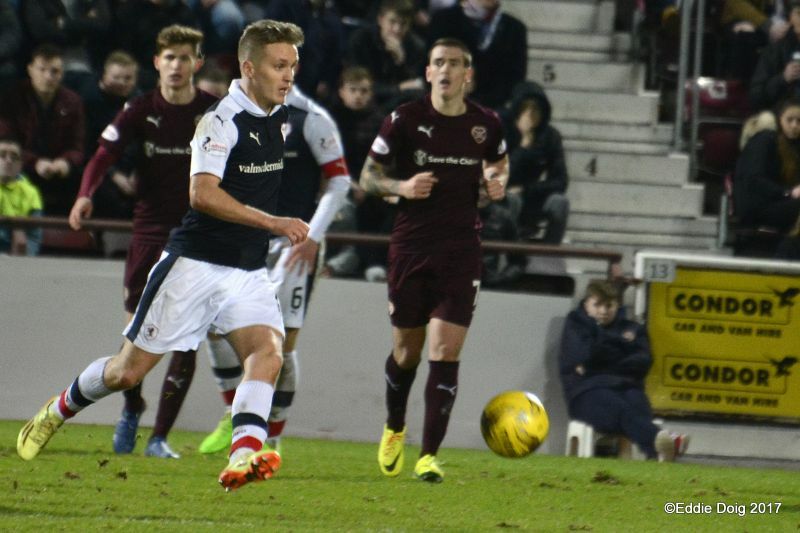 Hearts kick off the first period of extra time. Benedictus brings down Walker, penalty. 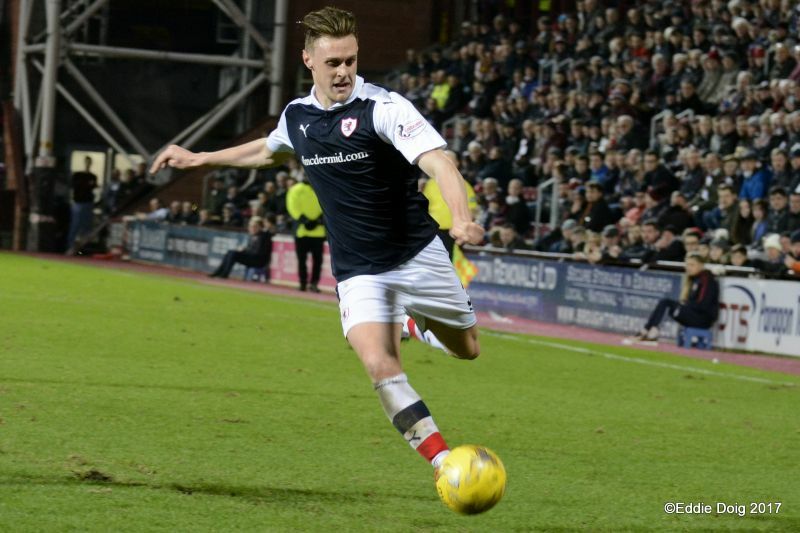 Martin chips the ball into the right hand side of the goal. 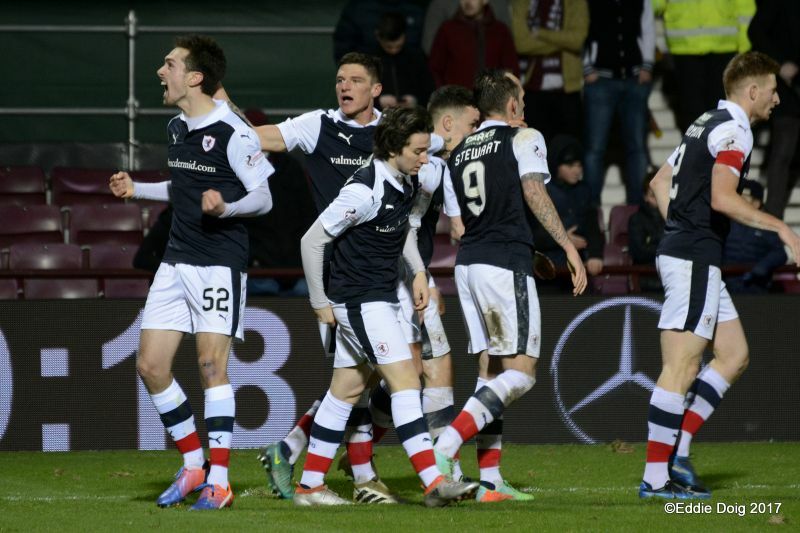 Hearts 2-1 Raith Rovers. 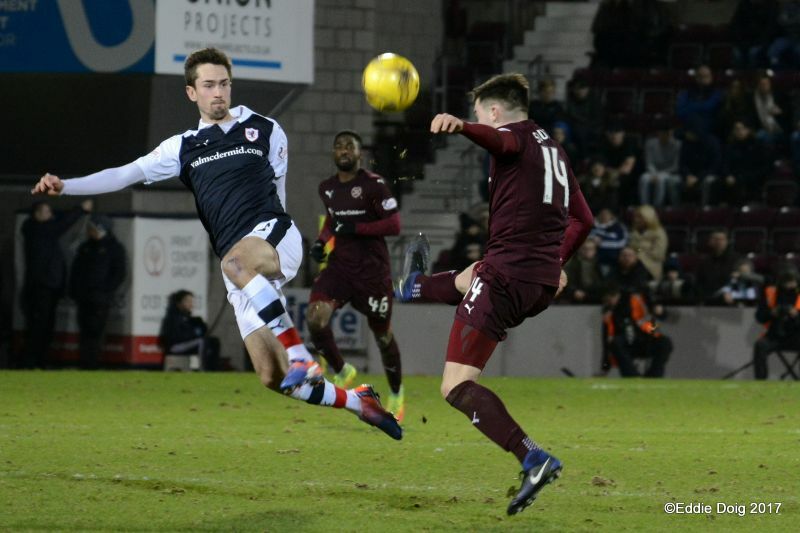 Currie hesitates and McHattie clears. Currie off, Zanatta on. 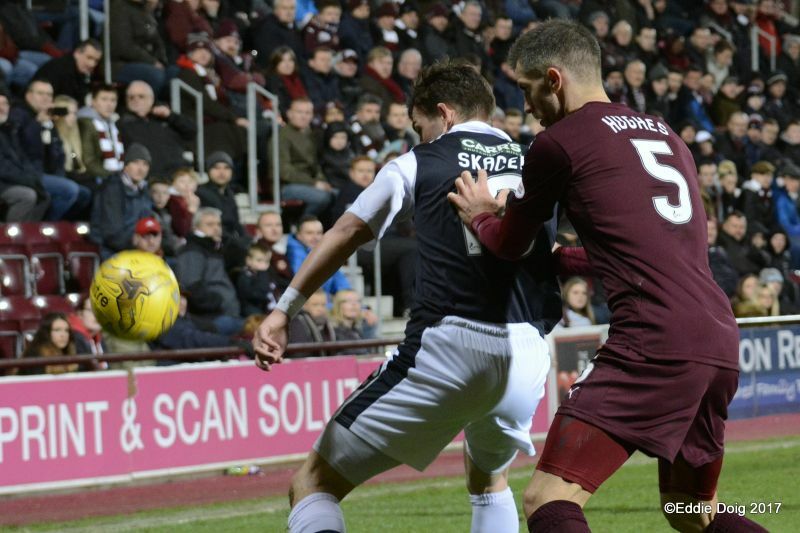 B Barr off, Skacel on. Walker shoots to his left and scores. 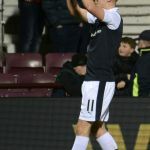 Gary Locke told to watch the rest of the game from the Stand. 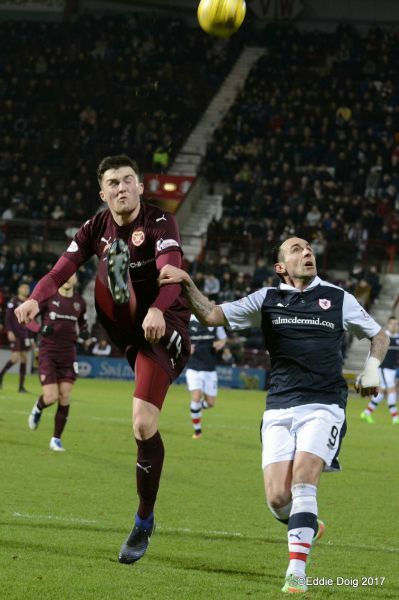 Skacel back heel to Hardie, Hamilton has to rudh out yo nlovk. Johnsen shoots past the face of. 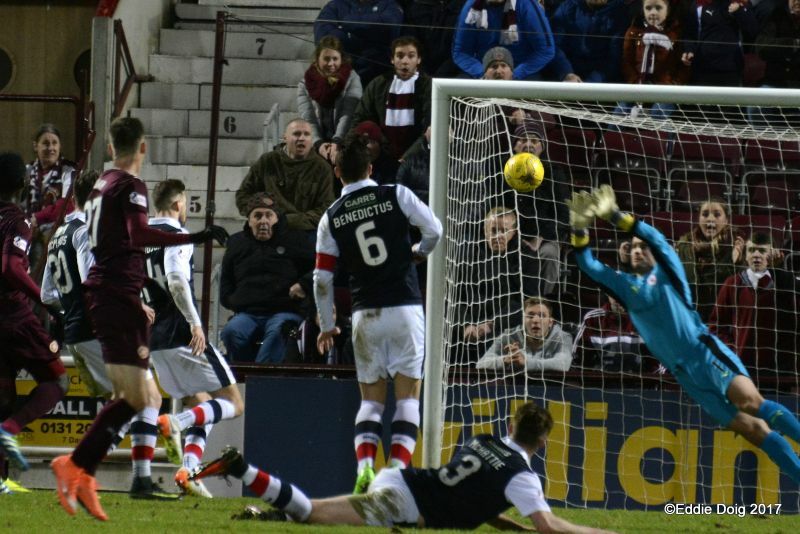 Johnsen skies the ball into the Roseburn. 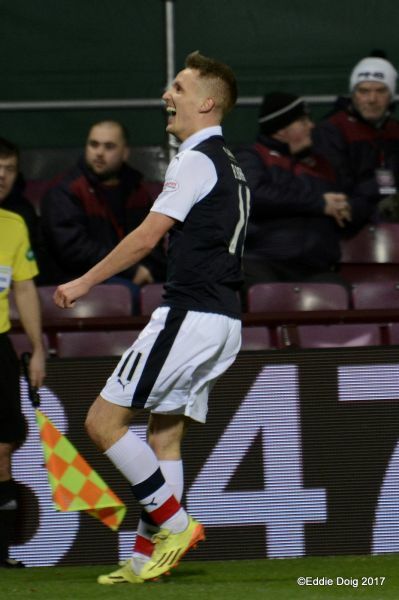 Goal Hearts. 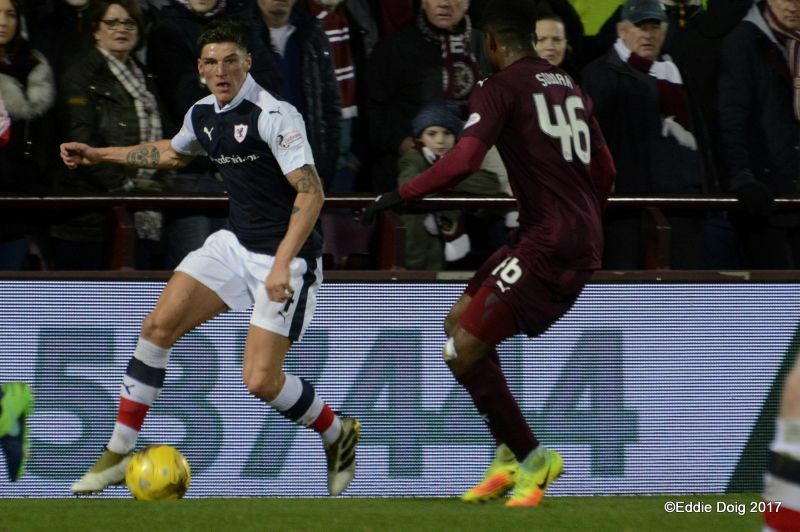 Sammon' shot is deflected into the path of Johnsen eho scored from 6 yards. 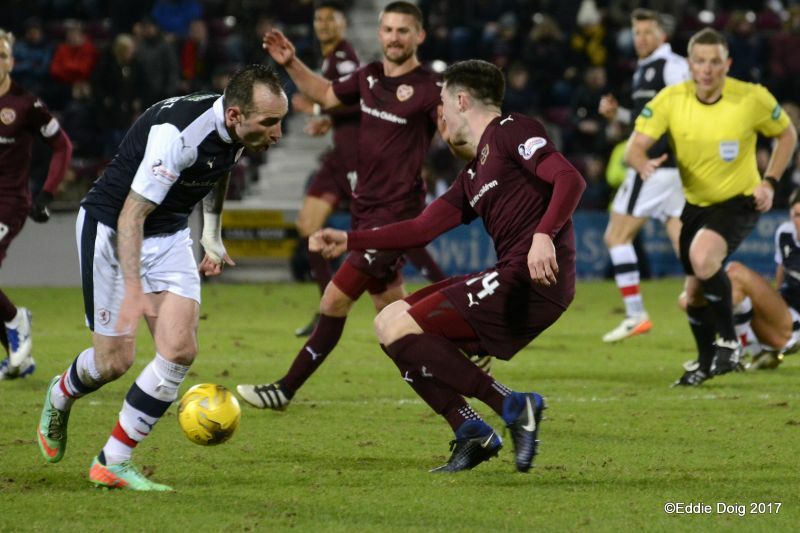 Sammon denies in th box by Callachan. Walker with a diving header nods wide. Handbags in the box. 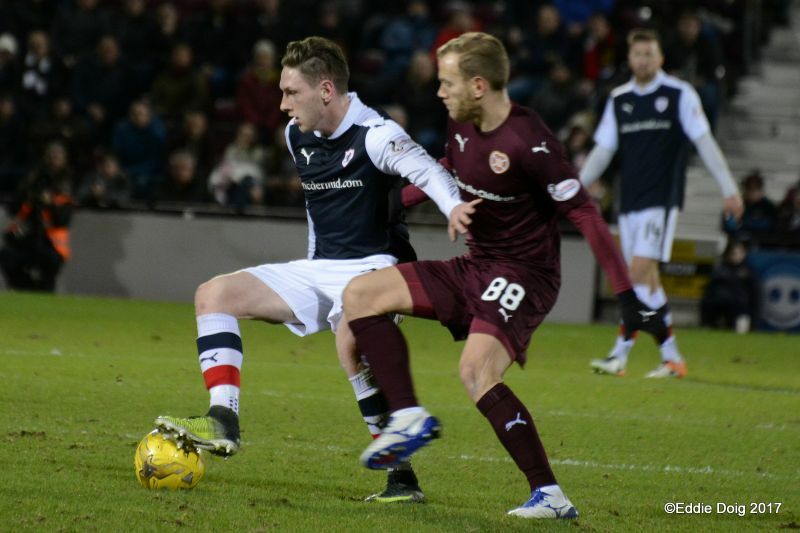 McHattie and Johnsen yellows. Full Time. 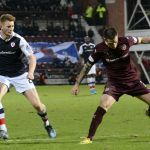 All the best to Hearts in the next round of the Scottish Cup. A great display by the Rovers tonight, well done lads. 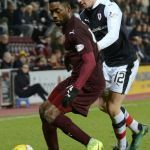 Hamilton, Struna, Souttar, Hughes, Sowah, Kitchen, Buaben, Martin, Walker, Currie, Johnsen. Subs, Horing, Smith, Oshaniwa, Beith, Zamata, Nicholson, Sammon. Subs, Brennan, Jason Thomson, Johnston, Roberts, Skacel, Hardie, C Barr. 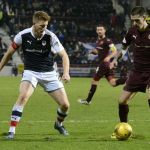 Raith Rovers and Hearts will have to do it all over again this Wednesday, after a second-half fight-back from Gary Locke’s team, meant Sunday’s Scottish Cup Fourth Round tie ended all-square. 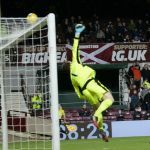 Jamie Walker gave the Gorgie side a first half lead, slotting past Kevin Cuthbert after an incisive through ball from Don Cowie, but Declan McManus ensured a replay would be required at Tynecastle, after he nodded a Rudi Skacel shot past Hearts goalkeeper, Jack Hamilton in the final minute. 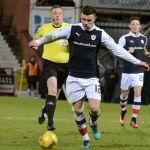 If Rovers are to reach the next round, they’ll need to do something they’ve never actually done before, win a cup-tie against the Jam Tarts at Tynecastle. August 1998 was the last time Rovers visited the stadium on cup duty, and whilst they pushed the hosts close, it was Jim Jefferies side who eventually prevailed in the League Cup Third Round fixture. 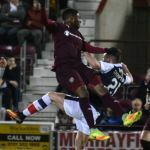 Hearts raced into a quick-fire two goal lead, thanks to goals from Stephan Adam and Jim Hamilton, but strikes in the second period from Paul Shields and Paul Hartley, sent the game head into extra-time. 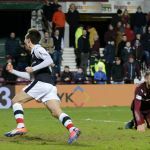 However, two goals in the last quarter-of-an-hour from Steve Fulton and an own-goal from Guido van de Kamp, eventually saw Hearts through to the next round. 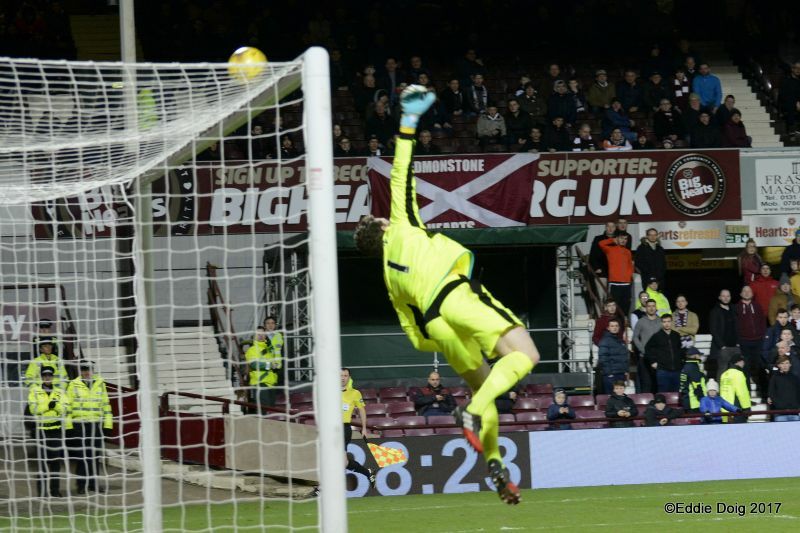 Hearts have a fine home record this term, with just Celtic and Aberdeen leaving Tynecastle with all three points, and with 23 home goals this campaign, only Celtic have been more free-scoring at home in the Premiership. 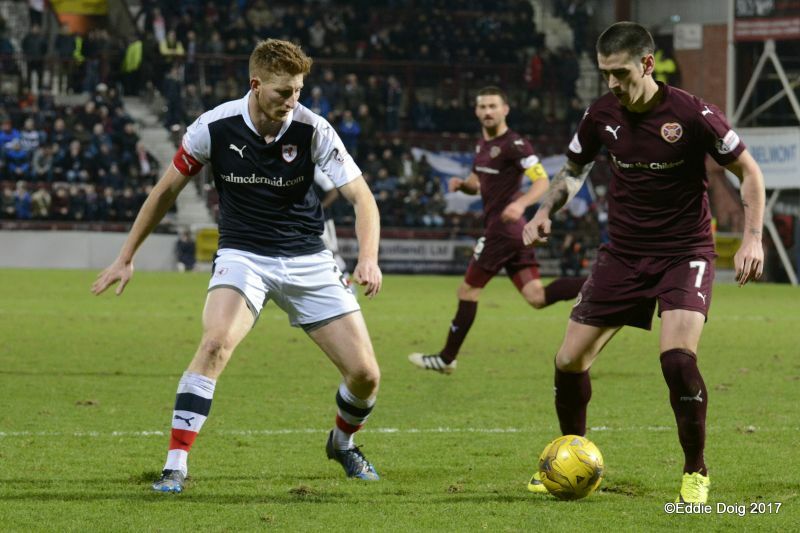 Wednesday evening’s match referee will be John Beaton.